Indie rock is hit or miss amongst the masses. The most forthcoming sub-genre to prevail consists of short and winding intricate guitar licks, dominant and sometimes off-tempo drumming, and a cross midway between catchy and unique. Depending upon which era's perspective is taken, the influences can range from Mineral and Sunny Day Real Estate, to Guns 'N' Roses, to Christopher Cross's "Sailing." Admittedly, that sounds odd, but the guitar progressions usually fall into one of two categories: broken-up licks directly removed from solos or arpeggiated open chords broken into choppy bits to give them more of a complex edge. MTV will catch up with it in five years like it is now catching onto the poppy punksters Saves the Day and A Newfound Glory. MTV2 might catch up in three. This might not be an insult to the sub-genre. It requires a bit of brains and fast, loose fingers in order to be able to write and play such music. What more could be asked for out of such a band? How about a female vocalist who has the ability to turn both phrases and heads? Enter The English System. The band is fronted by Jessica Larrabee. Her range is dynamic, deep and alluring. Imagine Billie Holliday with the ability to get sounds out of a Fender that not even Leo Fender himself could have anticipated. Of course, Jessica's voice is not the only good thing about the band, but it is arguably the main attraction. For a band that's been together for only a short period of time, they have managed to reach a level of tightness rarely reached by bands who have not been touring for the better part of a decade and up. "Banded Blue," the band's first full-length recording, is an impressive achievement that shows not a sign of sophomore-slump potential. The compositions are of very high quality - the lyrics are intelligible, accessible, and well-sung. Best of all, the songs are full-band efforts in which each instrument shines in its own right. If this is merely the beginning, it is safe to say that the end will go out with the kind of bang that only quality rock musicians can produce. Featuring a fine voiced Jessica Larrabee who also adds some guitar to the talent pool, The English System is one brand indie rock and one brand alternative pop ala 10,000 Maniacs. The lyrics are masterful and engaging, of which most bands completely lack especially in this field of music. Songs such as “Drizzle” fuse together thought-provoking lyrics and pure moods to coalesce in some form of worldly indie rock. 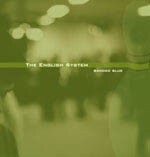 Catchy yet not overtly mainstream, The English System are a force to be reckoned with. Look for them in your town or in your local record store. You won’t regret it. Straddling the tinny, jangly chime of Beulah with the larger-than-life crunch of Superchunk, The English System balances its approach to the indie rock, Fender sound the way a Kung Fu master might balance tippy-toed on an upright lotus leaf. Fronted by the powerfully voxed Jessica Larrabee, this relatively new Philadelphia group comes to the table free of frills or gimmicks to offer a strong debut CD of guitar-driven, alternative pop dodging the early-90's default settings. Larrabee, who also adds some guitar to the mix, lends some strong definition to her band, at times invoking a less Starbucksy Natalie Merchant or a more Starbucksy Elizabeth Elmore (Sarge). “Faded Stained Glass” illustrates the work of a band not content to churn out It's a Shame About Ray carbon copies, while the title track suggests The English System is aiming for more than mere zip code celebrity.